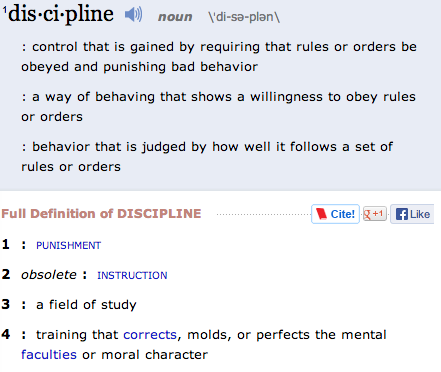 I thought I knew what discipline meant. The Latin root is disciplina which encompasses education, training and order. Tufts says that disciplina is instruction, tuition, teaching, training, and education and I’d always known discipline to be a benign word, positive even as it relates to children and education. Unfortunately I was wrong. You see, when I look it up at Webster’s the first definition is that discipline and punishment are synonymous and that “instruction” as a synonym to discipline is now obsolete. Academia needs to either reclaim the obsolete use of the word discipline or jettison it altogether in the lower grades. I cannot see a scenario where second grade teachers would need to punish children for academic infractions in order to have them learn. Second grade is a tricky year and it’s an important year (as they all can be) to have a skilled teacher. Developmentally 7 year olds are wiggly creatures who are only just beginning to really organize their thoughts. They are boastful and self centered and if you criticize them they have a tendency to shut down. Seven year old children need to be gifted with opportunities to succeed in the classroom so that they may continue to love school and learning. On my Facebook timeline I see two mothers with second grade children who are constantly missing recess due to missing homework or being made to run laps. I can’t even address the inappropriateness of homework before the third grade. Entire books have been written on the subject and we would be wise to pay attention to academics like Afie Kohn who remind us that there is no evidence that homework has any academic benefit in elementary or middle school. Let’s ignore all of the research, sigh deeply and recognize the fact that we are in America and American education equates more work with more learning regardless of research to the contrary. This means homework will be piled on as early as Pre-K. My son had Pre-K homework and absolutely loved it. 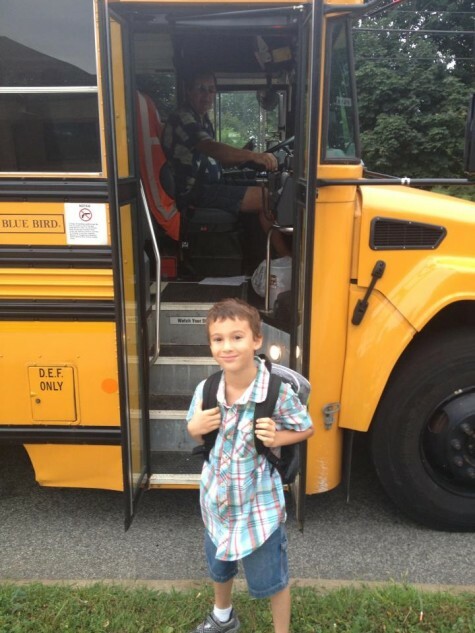 My son is the child that American schools were designed for, he is a lucky boy. Most children don’t enjoy homework. Homework robs children of valuable daylight hours where they can play and learn from experience rather than from books. Again, that’s a soapbox for another day. Here we are in a situation where a seven year old child has homework. In addition to bringing home and then completing said homework the child is then supposed to get it into their backpack, bring it to school and deliver it to the teacher. My 15 year old sometimes has difficulty with that. When a seven year old child forgets to bring home, do their homework, put their homework in their folder, put their folder in their backpack or take the homework out of the folder and give it to their teacher what’s a teacher to do? Some teachers withhold recess. Other teachers make the children run laps. If you are a principal, head of school, headmaster or on a board of directors I’d like to ask you to fire all your teachers who take away recess from children or punish children with running. I’m not saying this to be inflammatory or provocative, I am saying this because I love children, I love education and I love getting good teachers in classrooms. management is an inappropriate practice. school work or as a consequence for misbehavior. showing up late, talking, and disruptive behavior). game time), and then removing the threat because of good behavior. and California prohibit withholding physical activity or using it as punishment. ask them to complete complicated, multi-step tasks and then when they fail to meet expectations punish them either with exercise or with confinement. You don’t need an advanced degree to know that’s wrong. UPDATE: I need to add that the only reason I feel free to post about this particular issue is because it isn’t an issue at my child’s school. And yes, I love that place, and no, you cannot know where it is. Yes, after Alexander leaves in two years I’ll update this again so y’all can send your kids somewhere in LA where kids are educated and respected. My daughter has recess, lunch period (except for actual meal time) and other privileges taken away for missing homework, tests and bad behavior. Her school IS in California and it is a rule that this happen for those infractions. She is in third grade and the teacher makes them run 1-2 laps every morning so that by Spring they can get some certificate from a presidential program. If punitively taking away recess is against California law, then how is my daughter’s school getting away with it? Shan I don’t know. Running laps for fitness is a wonderful thing. It’s when it’s a punishment that it’s not allowed. I would call the principal and remind them that CCR Title 5. Div 1. Chap 2. Subchap 1. Art 3. Sec 352 declares that no student is to be required to remain in school during noon intermission or any recess. But then that’s just me.. The conundrum with taking away recess is that it is so frequently the kids who desperately NEED the recess in order to engage their brain’s learning and concentration centers are frequently the ones in trouble and get it taken away. An astute teacher will see this and address the situation appropriately. However, with the increasing pressure we put on teachers to “perform” we are squeezing those individuals out of the profession because they get their hands tied. True discipline requires creativity on the part of the teacher. Good teachers employ creative discipline, tailored to the child. Punishment is easy. Training is hard. I’m going through this right now. My first grader has missed four recesses (2 full days) because he failed to bring home a note signed by us – after he got in trouble for talking in line. Yet… no communication from his teacher. I found out because my kid told me. So I’m wondering, at what point was his teacher going to tell me? Ugh, that’s heartbreaking. I’d love to hear how it resolves. Tell me, did you have to run laps if you forgot homework? I am guessing no. I never heard of running laps. So kids forget from time to time to put their finished homework back in their bags. I know I had when I was a kid and all I got was a lecture and a reminder placed in my folder. Never once did I have to run laps and It is unacceptable for a teacher to make a child run laps because of a missed accident homework brought back. Plus a lot of kids are doing activities after school so that brought their energy down and their after school activities they are tired to do that and then they have to run laps or might get cut from the team. I am for education I am against Common Core (had to vent that) and I am against punishment for making a child run laps because of a forgotten assignment. Do you know if anything has changed in CA? My son’s teacher is making him run/walk laps at recess for not returning his homework. I can’t find anything that says she can’t do that and am at my wits end with frustration. He’s doing great in school but she’s angry he’s not completing the waste of time busy work worksheets. We just don’t have time and he’s being punished for something he can’t even control. Any guidance you’re able to provide is greatly appreciated. I have no words – I’m so sorry this is happening. I’ve done no research after writing this so I can only recommend doing your own.